Chelsea defender David Luiz has been at the heart of speculation throughout this summer. He has been linked with a move to several European heavyweights such as PSG, Bayern Munich and Barcelona, while it was reported that manager Jose Mourinho harbours concerns over Luiz’ defensive capabilities and might look to cash in on the Brazilian, while he’s in demand. Barcelona are still leading the chase to sign Luiz and despite seeing their initial offer rebuffed, the Catalan giants are looking to lodge yet another bid with a view to getting closer to Chelsea’s valuation of the player. In theory, the 26-year-old should be an ideal fit for Barcelona. In recent years, we have seen the Catalan giants have been reluctant to buy a proper centre-back rather have converted central midfielders in the mould of centre-halves/defenders like Javier Mascherano, Alex Song and Sergio Busquets. Modern football in terms of tactics has evolved with leaps and bounds. It might seem strange that two different positions have been converged so effectively, but that’s how the paradigm of modern football works – it focuses on ball retention and demands defenders and midfielders possessing excellent technical abilities. Further, there is an acute need of ball playing defenders these days. Since, football has become more technical and clever passing is the order of the day, we don’t see defenders jostling out in aerial duels too much these days than focusing more on winning balls on ground. Luiz is the perfect example of a typical ball playing defender. His defensive abilities were a suspect when he joined Chelsea couple of seasons back, but he has improved a lot and has adjusted himself brilliantly. Since Barcelona’s game is entirely based on the philosophy of tiki-taka, which simply relies on good passing abilities from various outfield players, in order to keep possession, a ball playing defender would have added enough value to their system. Last season, Rafael Benitez used him as a central midfielder alongside John Obi Mikel. The system worked, as Luiz provided perfect balance with his energy as contrast to Mikel’s steady positioning. The implications of Luiz playing higher up the pitch under Rafa were far from tactical. Lack of able defensive players in the side, forced Benitez to try out Luiz in that position due to his excellent passing range and bags of energy, coupled with his attacking threat. This is one area where he needs to curb his natural instinct a bit in order to excel under Jose Mourinho. The Portuguese doesn’t discourage his defenders to join the attack. He simply wants his defenders, if they are ball playing defenders like Ricardo Carvalho, Sergio Ramos, to understand when the right time to go for attack is. 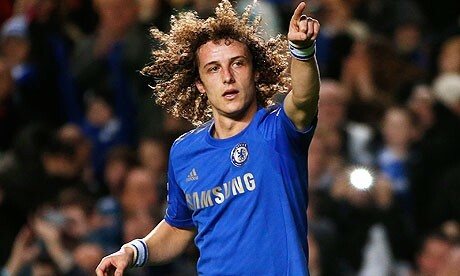 Luiz is a highly gifted player and he has the potential to be a world class defender in coming years. Chelsea value him highly, so much so that there have been reports towards the end of last season that the club are considering him as the next Chelsea captain. He probably will be a natural fit at Barcelona, but he can also achieve all the glories and success with Chelsea as well with slight improvisations and adjustments to his game.